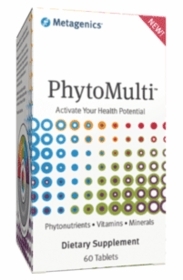 PhytoMulti takes you beyond basic wellness support. It has a proprietary blend of 13 concentrated extracts and phytonutrients with scientifically tested biological activity to protect your cells and maintain DNA stability--activating your health potential like no other supplement. PhytoMulti recharges, nourishes, and defends your cells like no other foundation nutrition formula. Enhanced with select bioactive plant compounds--including lutein, zeaxanthin, lycopene, and resveratrol. Warning: Excess vitamin A intake may be toxic and may increase the risk of birth defects. Pregnant women and women who may become pregnant should not exceed 5000 IU of preformed vitamin A (retinyl acetate) per day.